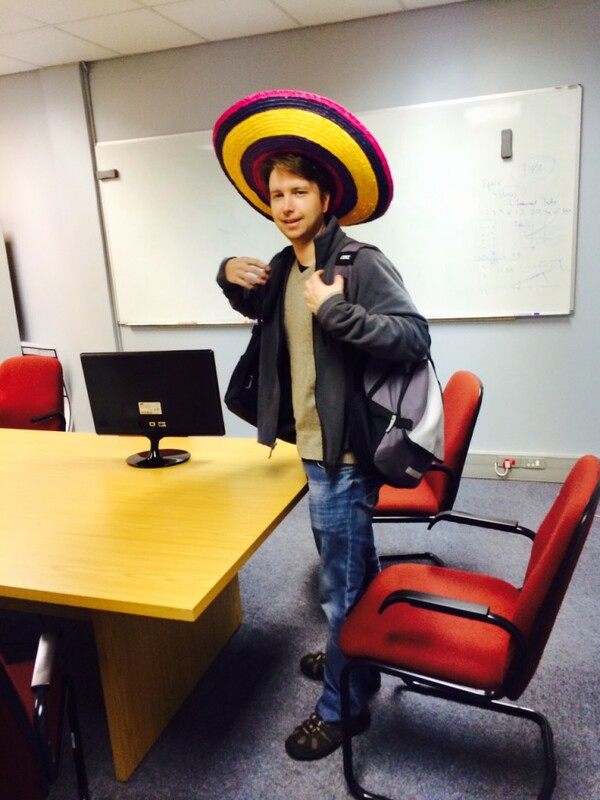 On Wednesday, 2 July, we had our 2nd Hackday for 2014. During this day anyone who’s had a coding itch was given the opportunity to scratch at it to their hearts content. The day kicked off bright and early with some much celebrated C12H22O11 in the form of muffins. This along with some reliably fresh Legado coffee (from next door) provided the initial impetus for a much celebrated creative brainstorming session. It would have been more interesting if we were able to employ the services of a buxom magician’s assistant but instead opted for the more politically correct services of the resident non Polymorph suit. After an initial false start because of somebody having entered on behalf of a fellow participant we got the show on the road with a concept by Wim that was nicknamed “Find my Bike”. With the latest spate of what seems like an increase in bicycle thefts and hijackings in the Western Cape everybody got behind the idea generation cycle of this idea wholeheartedly! Essentially the brief for the “Find my Bike” concept is that it would be beneficial for bicycle owners to, upon the event that their non-motorised iron horse becomes liberated from their person, to be able to accurately identify it’s location by means of a hidden embedded GPS transponder reporting it’s location by means of the GSM network. Hypothetically this information could then be leveraged in the retrieval from the liberators in question. Subsequent to this energetic, high paced idea generation discussion everybody was given the opportunity to either commit the rest of their day to one of the components that came out of the discussion or to designate any of their own ideas that they wanted to get cracking on along with a short description of what they intended being able to demo at the end of the day. In addition Polymorph was also forthcoming in providing an additional set of intriguing subjects to choose from. After this everyone involved got their heads down (apart from when the Pizza and beers arrived) and worked as hard and fast as they could in aid to present what they endeavored to by EOD. * the power of using the built in location indexing and querying of MongoDB in order to build a location server allowing easy geofencing and querying based on other location data. All in all everybody involved in the event really seems to have enjoyed it and we greatly look forward to the next one which should be taking place some time in September.